We have seen in one of the previous post that its not very difficult to integrate Spring.NET with MVC3 application. Almost every real project has a need to talk to a database for doing stuff. When it comes to interacting with the Database, NHibernate does an Awesome job. I have used NHibernate with legacy database as well as databases that were designed from scratch. IMHO, other competing products have a long way to catchup before they can be compared with the flexibility that NHibernate offers! Recently, in one of MVC3 project we integrated NHibernate using the Fluent API with Spring.NET. This process is not very difficult but it involves a few steps. I decided to document the steps for the benefit of the community. We will continue from where we left in the previous post, if you did not read the previous post already then, I strongly recommend reading it to understand how you can integrate Spring.NET with MVC3 application. Very well than, Lets start! Make the Web.config changes to include the Parsers config section in the spring configuration. Register the OpenSessionInView HTTP Module in web.config. We will be using single session per request, NHibernate session handling strategy. Register the DB provider in the spring configuration file. Write a custom implementation of the NHibernate Session Factory that loads and registers the Assembly that has Fluent NHibernate mappings in it. Lets execute the steps one by one. Please remember I will be continuing from where I left in the previous post. 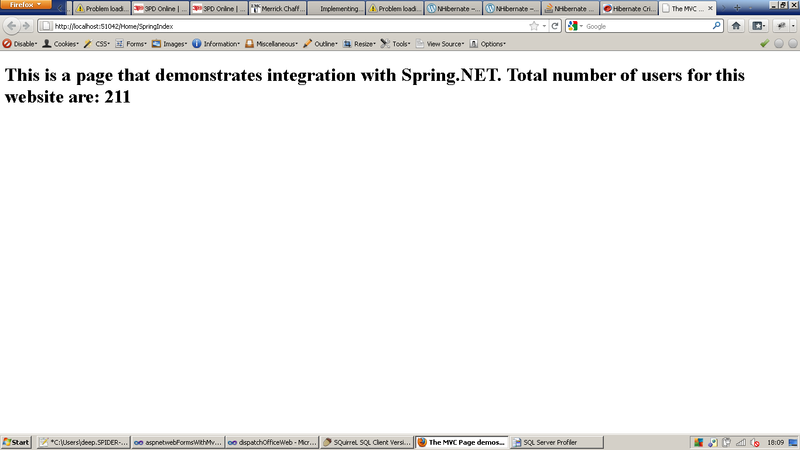 Hence, I will be assuming that you already have Spring.NET correctly integrated in your MVC3 application. To integrate only Spring.NET with MVC3 application we had to add a configurationSection called context. To integrate NHibernate with Spring.NET in a MVC3 application we have to add another configurationSection called parser. This section will help Spring.NET understand the Database and Transaction configuration. Lets look at how its done. Why do we need the OpenSessionInViewModule HTTP Module? Spring.AOP.dll -> Used to enable AOP using Spring.NET. This will be heavily used when we enable transactions in our application. Notice that we have to define the db name space in the objects root tag. Please update the above configuration with the DB Credentials that you are using. Session Factory is a heavy weight NHibernate object. Only one instance of SessionFactory is create per database. Lets look at the Spring.NET configuration file for registering the NHibernate Session Factory. NHibernate always interacts with the database using Transactions. We would definitely want to control how and when the transactions are started and ended. For that to happen we need to register the transaction manager in the spring configuration file. Add the following to the web.xml spring configuration file. We would want to govern how and when the transactions are started using Attributes. For this to happen we need to inform Spring.NET that we are going to use Attributes to define the transactional behavior we need. Spring.NET reads these attributes and starts/commits/rollbacks transactions using AOP. To inform spring.net about our intentions add the following line in web.xml spring configuration file. Notice that we added the line tx:attribute-driven but we also added the namespace tx in the objects root node declaration. If you have followed all the steps so far then you have successfully Integrated NHibernate with Spring.NET in an MVC3 application. To test out our brand new NHibernate integration with Spring.NET in an MVC3 application, lets change the implementation of the AccountService.UserCount method. Currently the AccountService.UserCount method returns a hard coded value of 5454. We will now replace it with the correct implementation, we will get the record count from the User table. We will have to create an NHibernate entity that maps to the User table. Lets create the User class that will map to the User table. We will also create a class called UserMap class that will hold the NHibernate Fluent Mappings for the User class. The details are embedded in comments. We have the User entity class and the UserMap mapping class to hold Fluent NHibernate mappings. Since we have registered the OpenSessionInViewModule HTTP Module the GetCurrentSession method of SessionFactory instance will return the same session instance that was created by the HTTP Module. This is absolutely vital for the Lazy loading to work correctly. Also notice that we have added the [Transaction] attribute to the method UserCount with TransactionPropagation as Required. This will make sure that whenever the method UserCout is invoked either a new transaction is started or the method will join any existing transaction started earlier in the same thread. All set! Its time to run the server and browse the /Home/SpringIndex URL to see if our integration with NHibernate works! As show in the image we are successfully getting the UserCount from the database. We have successfully integrated NHibernate with Spring.NET in an MVC3 application! awesome great tutorial. Actually the only one i found on the net.Very easy to follow. However im trying to save an object to the database... can you show how this should be done ? what transaction attribute to use etc. You can use the same transaction attribute i.e. I have one thing that irritates me! for me to save the object to the database i have to explicitly call Session.Flush(); thought I'm decorating my methods with [Transaction]. You have suggested using [Transaction(TransactionPropagation.Required)], however session management in Spring.Net seems a bit vague for me, don't know which is the best method to use with MVC ! also could you please further elaborate Spring.NET OpenSessionInViewModule and how it's best used without explicit calls to Session object ? The OpenSessionInViewModule intercepts the requests coming to the MVC controller. It opens up an NHibernate session and binds it to the CurrentThread. Once the request is processed, it flushes and closes the NHibernate session. If you add this module to your web.config, the session should flush automatically. The transaction attribute will not work as Spring.Net applies aop only to "virtual" methods and not to methods calles from within the same class (limitation pf proxy based AOP). As a MVC3 controller delegates the call to the action method via an internal method => "Execute(RequestContext requestContext)" the proxied method is never called.